Days after Christopher Newport reached Jamestown on May 24, 1607, he put a cross in the ground in honor of King James l of England. Since then the land has been through multiple wars. In 1646 England revived the land from a treaty but by the 18th century it was owned by William Byrd, who was very successful in his trading of fur, rum, tobacco, and slaves. The land was eventually passed down to his son, William Byrd ll, who was pressured in to setting up a town on his plantation by the Colonial Assembly. This town later became Richmond. In 1907 the Association for Preservation of Virginia Antiques made a cross to recognize the significance of the area's early history. 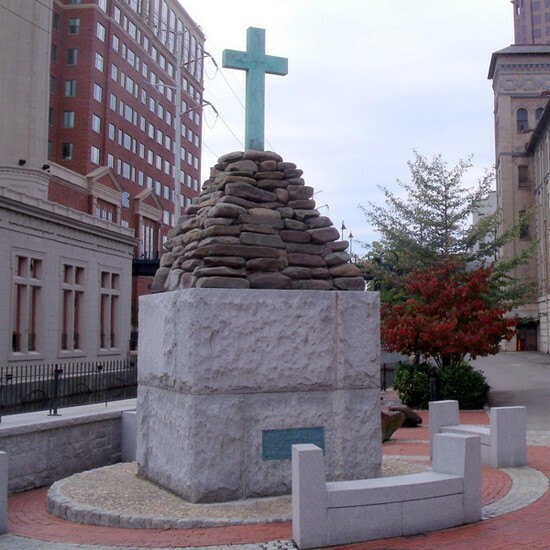 The cross was then moved to 12th street in 2000. You can get to it from the intersection of South 12th Street and east Byrd Street.